What motivates your choice of what you do? 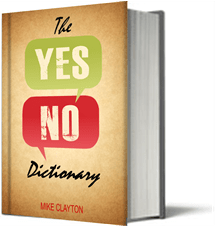 Knowing when to use your NO, and when to say a whole-hearted YES is critical. Goal-directed activity (noun); the things that you must do, that you want to do, that make a real difference to what you can achieve in your life, in your work, in your vocation. Things you do because they are right and because you believe in them. These are the activities to say YES to. Guilt-directed activity (noun); the things that you ought to do, you should do, and you feel guilty if you donï¿½t do. You do them purely to please other people. Your motivations are usually duty or loyalty to people and institutions that no longer serve you well and you are driven to do them often out of fear of the consequences of not doing them. Guilt-directed activities are the ones to say NO to. Deprecated. Desire-directed activity (noun); the things that you do to enjoy the moment. They are an immersion in the now, rather than focused on the past ï¿½ as guilt-directed activities are, or the future ï¿½ as goal-directed activities are. Displacement-directed activity (noun); an activity that displaces another activity that would be a better use of your time. Deprecated.